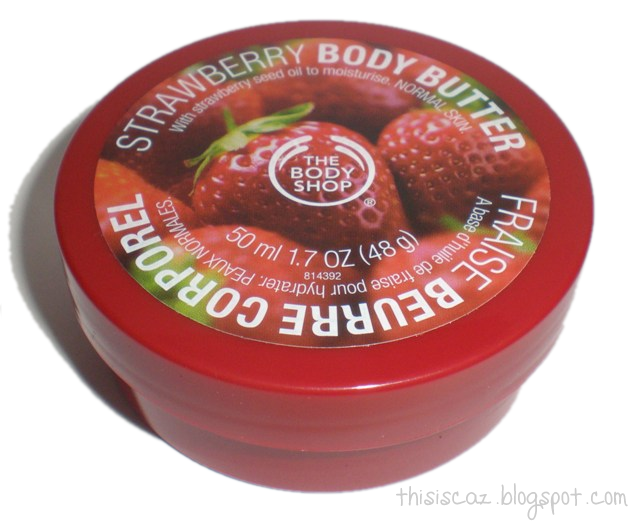 I know a lot of you will have tried The Body Shop's Body Butters but this is the first one i've ever had. The main thing I like about it is the smell - it smells just like the Calpol medicine I had when I was little! I sometimes just put it on my hands so I can smell it! It's really moisturising so is great for dry skin on your hands, especially at this time of year.I got mine in a little set for Christmas - you can get a little 50ml tub for £5 online although if you look in the sale you can get it cheaper in a set - I love it so much i've ordered a couple more tubs! Are there any other Body Shop Body Butters I should try? I carry this in my purse! Its perfect as a hand cream and I love the smell! I love cocoa and coconut but in the summer the peach and passion-fruit ones are so fruity and refreshing although I don't think they're as sweet as the strawberry one.